Gettysburg Licensed Battlefield Guide Rich Bellamy is standing on East McPherson’s Ridge near the monument of Brigadier General James Wadsworth. The sculptor was R. Hinton Perry, and the monument was dedicated on October 6, 1914. This view was taken facing southeast at approximately 5:00 PM on Thursday, May 13, 2010. Gettysburg Licensed Battlefield Guide Rich Bellamy begins a series on Cutler’s Brigade of the United States’ Army of the Potomac. In today’s post Rich provides background on division commander Brigadier General James Wadsworth, the 104th New York Infantry Regiment, and the brigade commander, Brigadier General Lysander Cutler. This map shows the location of the videos for Cutler’s Brigade posts. Video #1 was taken near the statue of Brigadier General James Wadsworth. 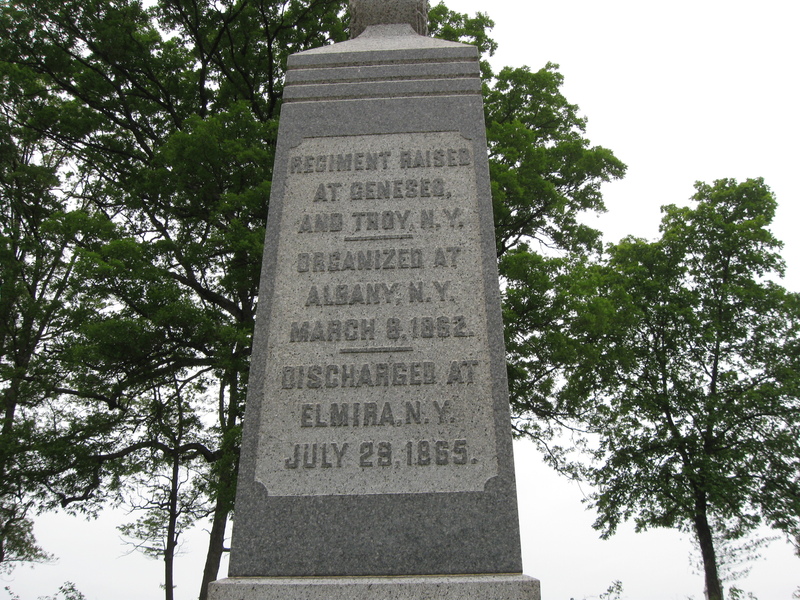 Video #2 was taken at the monument to the 104th New York Infantry Regiment. Videos #3 and #4 were taken at the Cutler Brigade plaque on Reynolds Avenue. 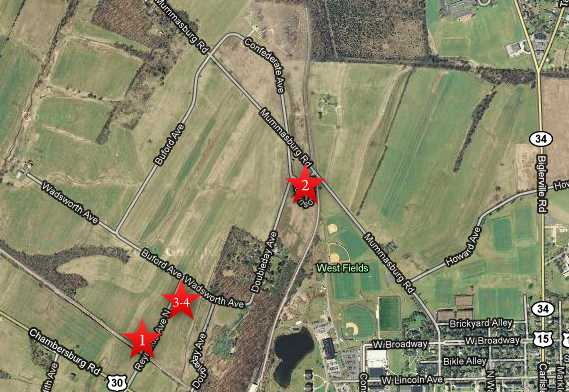 This map was created facing north at approximately 12:00 PM on Saturday, May 15, 2010. 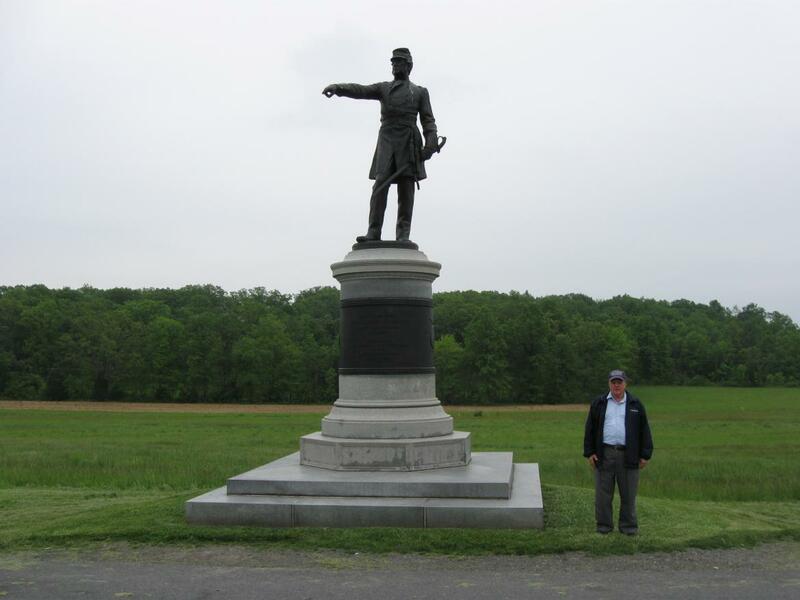 In Video #1 Gettysburg Licensed Battlefield Guide Rich Bellamy is standing on East McPherson’s Ridge near the monument of Brigadier General James Wadsworth. He gives some background on Wadsworth and of a replica of this monument. This view was taken facing southeast at approximately 5:00 PM on Thursday, May 13, 2010. 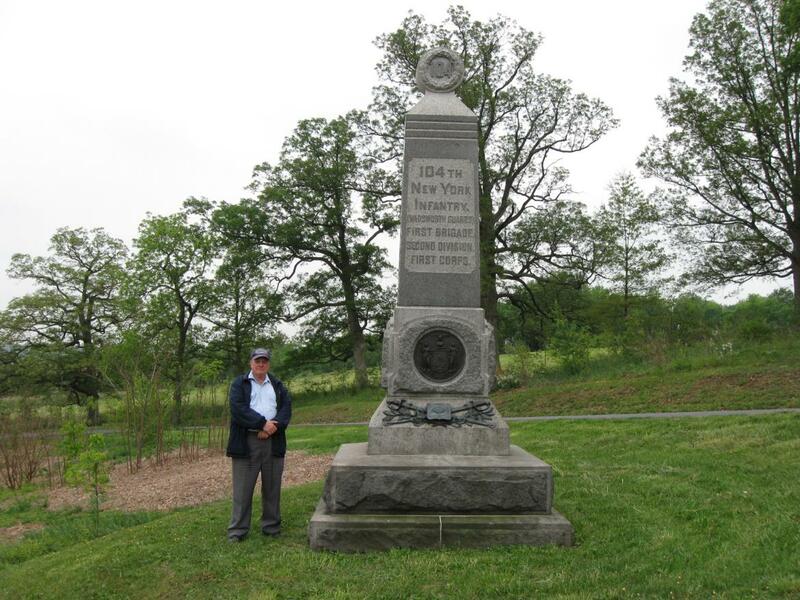 Licensed Battlefield Guide Rich Bellamy is standing by the monument to the 104th New York Infantry Regiment on the eastern slope of Oak Ridge. This view was taken facing southwest at approximately 5:00 PM on Thursday, May 13, 2010. In Video #2, Licensed Battlefield Guide Rich Bellamy is on the east slope of Oak Ridge, near the monument to the 104th New York Infantry Regiment. He explains the association between this regiment and James Wadsworth. This view was taken facing west to south to southwest at approximately 5:00 PM on Thursday, May 13, 2010. A closer view of the east side of the monument to the 104th New York Infantry Regiment. This view was taken facing west at approximately 5:00 PM on Thursday, May 13, 2010. 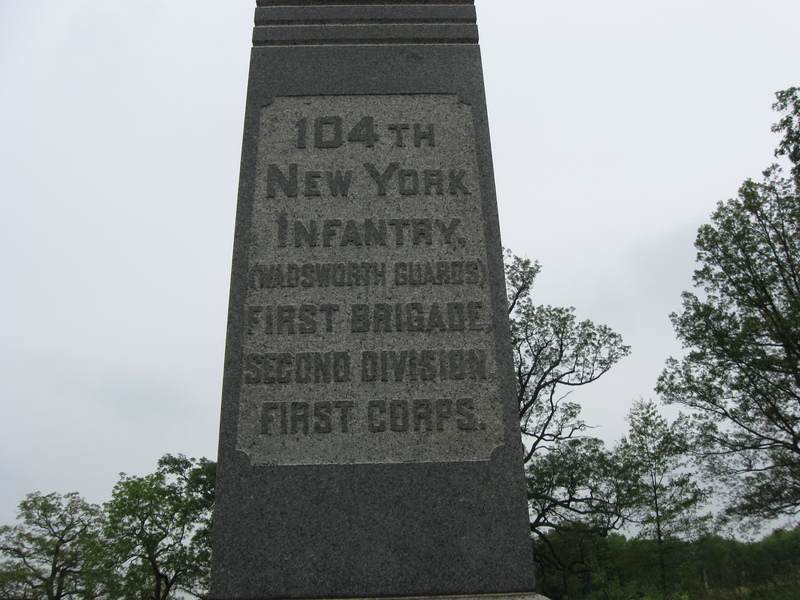 A closer view of the north side of the monument to the 104th New York Infantry Regiment. This view was taken facing southwest at approximately 5:00 PM on Thursday, May 13, 2010. 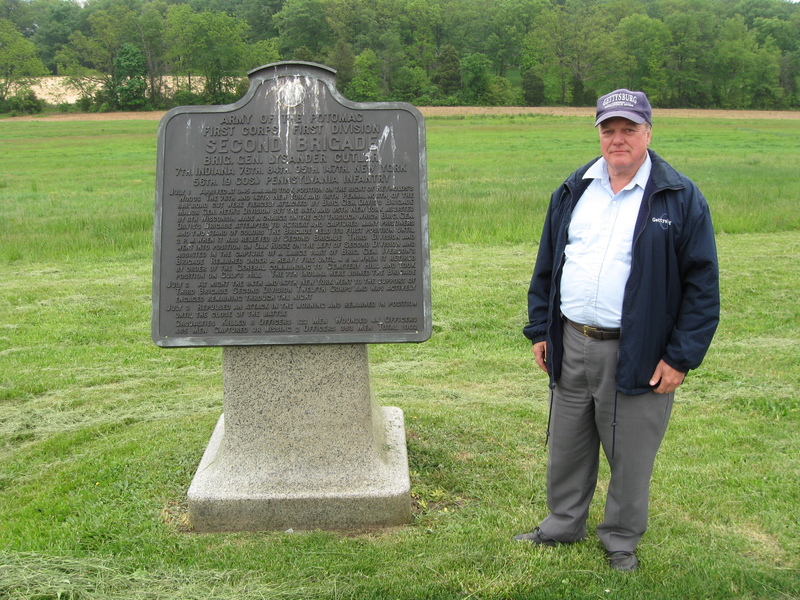 Rich Bellamy is back on East McPherson’s Ridge, this time near the Cutler’s Brigade plaque. Sheads Woods are in the background on Oak Ridge/Seminary Ridge. This view was taken facing southeast at approximately 5:00 PM on Thursday, May 13, 2010. In Video #3 Rich Bellamy is standing on East McPherson’s Ridge near the plaque for Cutler’s Brigade. He provides some biographical information on Lysander Cutler until the Battle of Gettysburg. This view was taken facing southeast to east at approximately 5:00 PM on Thursday, May 13, 2010. 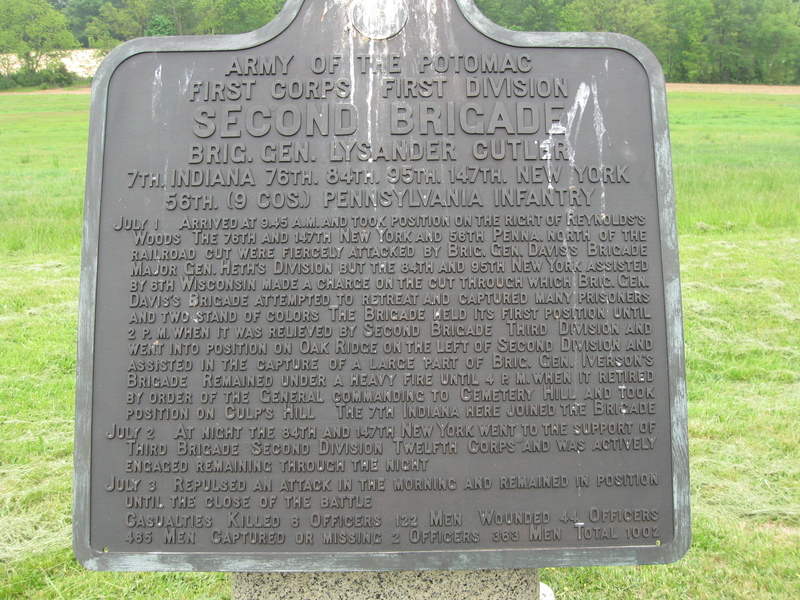 A closer view of the Cutler’s Brigade plaque. This view was taken facing southeast at approximately 5:00 PM on Thursday, May 13, 2010. In Video #4, Rich Bellamy shares information about the life of Lysander Cutler following the Battle of Gettysburg. This view was taken facing southeast to east at approximately 5:00 PM on Thursday, May 13, 2010.